One of my favorite school supplies to buy each year is a planner. Having a planner is what keeps me from losing my head during the school year. So I am going to show you what planner I am using for this year and how I organized my planner last year. This is my planner for this year. It is a Lilly Pulitzer large agenda in the pattern Exotic Garden. This planner costs $30. I have never used a Lilly planner but I have heard they are amazing which is why I wanted to try one out. This is what the weekly layout looks like. There are eight lines for writing things down which is great because I only have seven classes. This is my Vera Bradley planner that I used last year. I absolutely loved this planner! The front cover is plastic so it is very durable and it lasted. The only problem with the cover is that it is starting to fade. The price of this planner is $25 and I got it in the pattern Katalina Pink. This planner was great and the only reason I didn't get a new one this year is because I didn't like the patterns the Vera planners came in. So now on to how I organize my planner. I am going to show you the monthly layout and the weekly layout as well as the supplies I use in my planner. So here is what a month in my planner usually looks like. It's very colorful,busy, and all over the place. I like to put school events, homework, due dates, and anything else for school in a bright color. The things that happen outside of school such as stock shows, birthdays, and when I go to my dad's house are written in black. I also like to make it look fun by coloring in the doodles for holidays and putting fun bubbles around certain events. Here is a look at another month in my planner that didn't seem to be as busy. Now onto the weekly layout of my planner! So here is what a day in my planner looks like. There were six lines for each day of the week and I had seven classes so I just didn't write down homework I had for art class. Line one is first period, line two is second period, line three is third period and so on. I did each line in a different color in case I had a lot of homework for one class and ended up having to take up two lines for that one class. Even if I didn't have homework in a class I still wrote down that I had no homework instead of leaving it blank for two reasons: 1. I would get confused about what class I did and didn't have homework in and 2. I like crossing things off. If you couldn't already tell the reason that I cross things off is so that I know what I have and haven't finished. My favorite supplies to use in my planner are colorful pens. These pens above are Vera Bradley pens that I got to go with my planner last year and I do not recommend them. As you can see the pink pen leaks and it has since I got them and the reason it has washi tape around it is because the lid cracked and the lid doesn't stay on. These are G-2 pens and they are great! You can get them at Walmart, Target or any place that sells office supplies. I have had these for about two year and there is still ink in them and they are in great condition. I also enjoy using washi tape to make the page more fun and stickers are also something you can use to spice up your planner pages. If you still have your planner from last year and don't know what to do with it and it has cute patterns on the pages like a Vera or Lilly planner, keep it for a few more weeks. 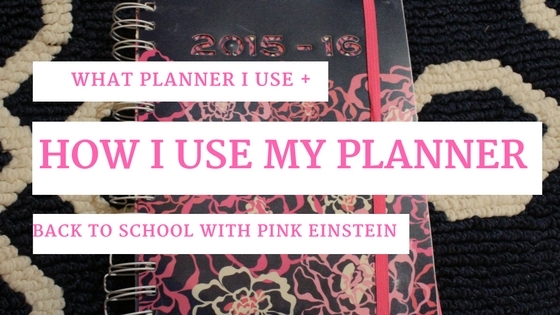 I am showing you a DIY with your old planner in a few weeks! YOU ARE SO ORGANIZED. I love that.